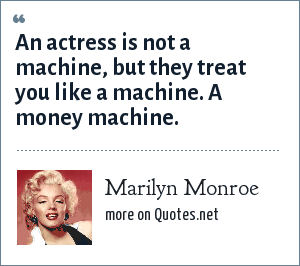 Marilyn Monroe: An actress is not a machine, but they treat you like a machine. A money machine. "Marilyn Monroe Quotes." Quotes.net. STANDS4 LLC, 2019. Web. 23 Apr. 2019. <https://www.quotes.net/quote/41334>.